Norfolk State University (NSU) is a four-year, state-supported, coed, liberal arts institution, foun…. 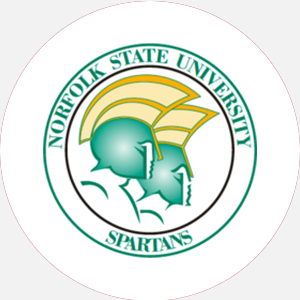 Norfolk State University (NSU) is a four-year, state-supported, coed, liberal arts institution, founded in 1935 as the Norfolk State Unit of Virginia Union University (VUU). In 1942, the school became independent of VUU and was named Norfolk Polytechnic College. Within two years, by an act of the Virginia Legislature, it became a part of Virginia State College (VSC), and granted its first bachelor’s degrees in 1956. The college divided from VSC in 1969 and was named Norfolk State College. When granted university status in 1979, the school’s name changed to Norfolk State University. NSU continues its mission to provide an affordable, high-quality education for an ethnically and culturally diverse student population, equipping them with the capability to become productive citizens who continually contribute to a global and rapidly changing society. Norfolk State offers 36 Undergraduate, 15 Master’s, and 2 Doctorate degrees with new Bachelor’s degree program being offered in Optical Engineering and Master’s degree programs in Optical Engineering, Computer Science, and Criminal Justice. Eighty-five students attended the first classes held in 1935; today NSU boasts an enrollment of more than 6,500 with students from all sections of the United States and 38 foreign countries. Although a young institution, the University prospers as one of the largest black institutions in the nation. It ranks 9th among schools graduating African Americans with bachelor\’s degrees. Located on the former site of the 50-acre Memorial Park Golf Course, which the city of Norfolk sold to the school for one dollar, the campus now encompasses 134 acres of land and 31 buildings. The Joseph G. Echols Memorial Hall is a large health, physical education, and ROTC complex with a seating capacity of 7,500. Other facilities include a 30,000-seat football stadium; a television studio and radio station, an African art museum, and a magnificent multi-purpose performing arts center. Research facilities include a life sciences building with a planetarium and a materials research wing with crystal growth, organic synthesis, laser spectroscopy, and magnetic resonance equipment. Norfolk State University is accredited by the Southern Association of Colleges and Schools (SACS) to award Associate’s, Bachelor’s, Master’s, and Doctoral degrees. Percent of students who received financial aid: 81% Financial Aid Specific to the School The Alumni Association Scholarship is available to students meeting varying criteria as determined by each individual alumni chapter. Students should contact the NSU Alumni Affairs Office. Presidential/ Board of Visitors\ Scholarships are given to Virginia residents with at least a 3.0 GPA and 900 SAT or 19 ACT. Students must be first-time freshmen or transfers and must enroll full-time. Students should contact the Admissions Office. April 1 (recommended fall); October 15 (recommended spring); nursing applicants December 1 prior to fall semester of desired entry. A minimum of 120 semester hours of credit; completion of the General Education Core requirements; minimum cumulative grade point average of 2.0; have met all requirements of the curriculum leading to the degree for which he/she is a candidate; have spent a minimum of two semesters in residence at Norfolk State University, and have earned a minimum of 30 semester hours of credit during this period, including all of the courses required by the senior year curriculum. Campus Regulations: Cars must be registered. Residence hall visitation permitted during designated hours. Campus Services: Health clinic, personal and psychological counseling, career counseling and placement, disability services, student employment, and tutoring. Campus Activities: Social and cultural activities include theater, concerts, orchestra, jazz and marching band, choir, and dance. Other activities include films, art exhibits, recitals, and seminars. Students may get involved in the student-run newspaper or yearbook. Communications majors may work at the student-run radio station, WNSB. Leadership opportunities are found in the Student Government Association (SGA) or the more than one hundred-ten student organizations. Greek letter fraternities include Alpha Phi Alpha, Kappa Alpha Psi, Omega Psi Phi, and Phi Beta Sigma; sororities include Alpha Kappa Alpha, Delta Sigma Theta, Sigma Gamma Rho, and Zeta Phi Beta. Seventeen Honor societies are also represented on campus. Housing Availability 1944 housing spaces; freshmen given priority; off-campus housing permitted.